Providing Real Estate Websites to Professionals WORLD-WIDE - the most powerful website and property listing management solution available on the web! Free Professional Real Estate Website Template of your choice with any order! Fully Automated Solution. Listings are automatically imported & professionally displayed on your site. Listing data automatically refreshed daily. Import All or Individually Input your listings and listing photos. Feature rich and full customization of listing data & fields. Using special coding, your MLS listings are framed within pages of your website. Excellent solution for limited budgets. We help you to break free from from the everyday cookie-cutter websites that are so popular with our competitors! Our real estate web site design packages provide you with the most powerful tools available on the web for managing both your real estate web page content and real estate property listings. With our packages, you have a choice when it comes to your real estate websites design! You can choose from 1000s of professional real estate website templates at no charge, which we brand and customize to meet your needs, or you can choose to use your existing design. Click here to view our real estate web design packages and pricing. Worry Free web page and property listing management - no HTML or programming experience required! When you order one of our powerful real estate web site design packages we do all the complicated programming for you, including your design. 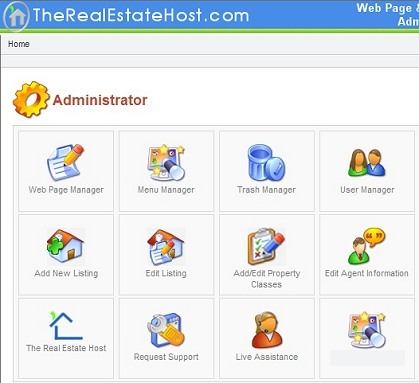 When we release your new real estate websites to you, we provide you with a backend administrator which enables you to manage your entire website and property listings using nothing more than the browser you are using to view this web page without needing any HTML or programming experience. Give it a test drive by requesting a trial site for 20 days at no charge! We offer 3 different MLS / IDX Integration options priced to fit any budget! MLS / IDX integration is the method in which you choose to pull in your real estate property listings from your MLS. You can choose smart framing or FTP Feed IDX integration to pull in your listings from your MLS, or you can choose to work independent from your MLS completely by choosing our real estate Property Listing Software, or both! Click here to learn more about the different MLS / IDX integration methods available.